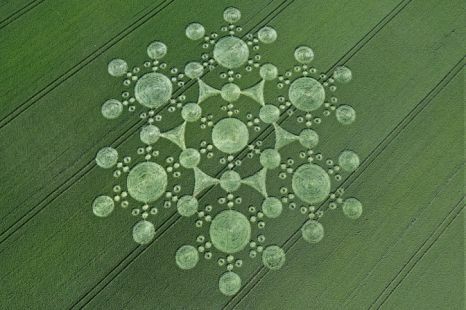 Of all the weird supposed-UFO phenomenon out there, my favorite has to be the crop circle. Not because of any real UFO connection, but just because they’re always really visually appealing. Take, for example, the most recent crop circles to appear outside the village of Mere near the UK’s UFO capital, Warminster in Wiltshire. These are the first crop circles in the area since 1997. This design, believed to reflect the passage of the sun and moon through the skies, is composed of a staggering 193 rings, with six outer rings and a seventh inner ring. Even if these are just some bored guys hanging out in a field or some kind of ad campaign, they’re still really impressive, aren’t they? That’s a whole lot of planning and work over night just to get some attention. You have to appreciate that kind of dedication to the cause of publicity.